The society was initially formed at the Hingham Primary School with the encouragement of the Headmaster, Paul Planken and the tireless efforts of our Honorary Life President, Spencer Allen, along with about five members, in November 1993. However, the problems of light pollution in Hingham, with streetlights, floodlights at the Sports Centre and badly adjusted security lights created a problem for astronomical observing. The society moved its activities to the Great Ellingham Recreation Centre, B1077, Attleborough to Watton Road where darker skies prevail. 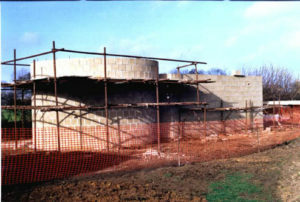 The possibility of an observatory being built on ground alongside the sports field was considered in 1994 and Great Ellingham Parish Council was subsequently approached for permission to build at that location. Peter Brooks, architect, Hingham, was asked to draw up the specification for an observatory. In 1995 intensive fundraising efforts commenced for achieving a target of £32,000. 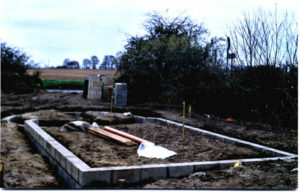 Planning permission was obtained from Breckland Council in June 1996. In all, five applications were submitted to the National Lottery Charities Board, between 1994 and 1999. Each one was turned down! Grants were awarded by Breckland and South Norfolk Councils, Norfolk Rural Community Council, Norwich City Council, Wymondham, Attleborough, Dereham and Hingham Town Councils as well as several Parish Councils in the area. Our own fundraising included an ‘Auction of Promises’, including promises from Lord Archer, Baroness Thatcher, the Prime Minister, the Leader of the Opposition, the Rt Hon John Major, CH, MP, Rt Hon John MacGregor, OBE, MP, Rt Hon Gillian Shephard, MP, and many local businesses and private donors, amounting to a total of 55 in all. Sales of plants, cakes, books and bric-a-brac at different venues helped finally to raise a sum of £8,000 over the period. 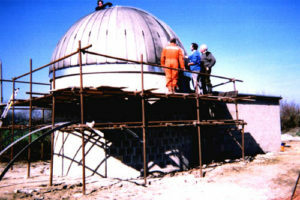 Finally, the opportunity to start construction in 1999 came when the University of Hertfordshire made the decision to donate the dome, which they had replaced at their observatory, to our society. 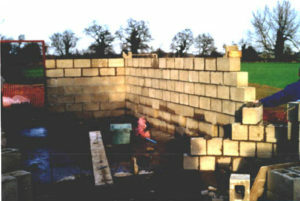 The foundations were commenced by Trell Contractors (Watton) Limited, after the Rt Hon Gillian Shephard, MP, dug the symbolic turf on 5 November 1999. 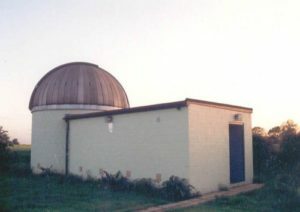 Ronnie Hawkins, builder, Hingham, built the observatory and, in March the following year, the Dome was assembled over the telescope room by our members, under the guidance of Tony Fox Carter, a senior member of the society. A grant was obtained from the National Lottery, Awards for All, which enabled us to purchase the 19 inch diameter primary mirror and a secondary mirror for the Newtonian Telescope from a specialist, Jim Hysom, Hytel Optics, Cambridge. 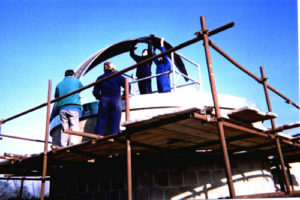 Tony Fox Carter manufactured the structure of the telescope and with the aid of members installed the telescope in the observatory on the 28th September 2000, after the internal work, electrics, ceiling board, painting and many other tasks had been completed. ‘First Light’ was in the early hours of the 1st October 2000, when suddenly the skies cleared and made it possible to view objects in the night sky. 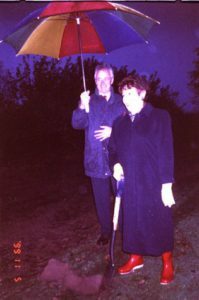 We have a good liaison with the Institute Of Astronomy, University of Cambridge, hence the reason for Professor Gerry Gilmore being invited to officially open the observatory on 28th October 2000. Similarly it is intended to work with the University of Hertfordshire by encouraging some of their students to carry out observations from our observatory, as they are not blessed with dark skies. The observatory is an asset to the local community, providing youngsters in particular an opportunity to develop their knowledge of astronomy, a subject in the National Curriculum. All schools within a reasonable distance of Great Ellingham are invited to visit the observatory. The public have the opportunity to visit on ‘Open Night’ occasions to see for themselves the wonders of the Universe.